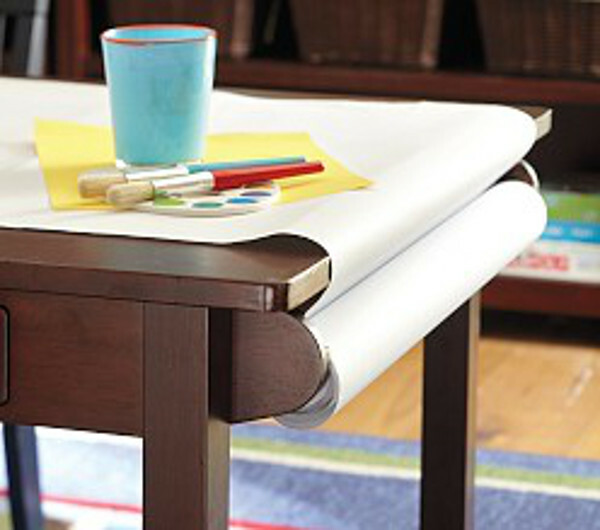 If there’s one thing you need in every children’s playroom, it’s a sturdy craft table. Now imagine you had one as good as this. The Carolina Craft Table from Pottery Barn Kids is more accommodating than your average kids’ table. At 121 cm long and 69cm wide, it sits up to eight children. Now that’s one fun craft party! The table is made of kiln-dried solid hardwood and comes in three colours – Sun Valley Espresso, Simply White and Tuscan. All finishes have been sealed with a final coat of lacquer for extra durability and the smooth surface is easy to clean. A clean, damp cloth is all you need, so avoid chemical cleaners. Come glue, come glitter, the Carolina Craft Table will endure it all. The table fits a 46cm paper roll, which sits snuggly underneath the table (sold separately). Drawers neatly stow away all the crafty bits and bobs – perfect for a quick tidy at the end of an exhaustive art session. Pottery Barn Kids sells the table for $316 and ships to all Australian states. It comes in a flat-pack, so assembly is required. Chairs are sold separately.